Southwestern Coral Bean is a member of the Pea Family. The plant appears as a shrub or small tree and grows to 15 feet in height. It has grayish green leaves with 3 triangular leaflets that grow to 3 inches in length. The plant typically grows on dry rocky hillsides at elevations between 3000 - 5000 feet. 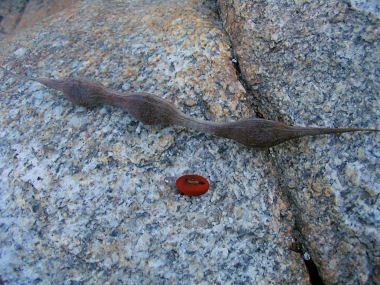 The bright red seeds of the Southwestern Coral Bean are very poisonous and sometimes used in Mexican jewelry. 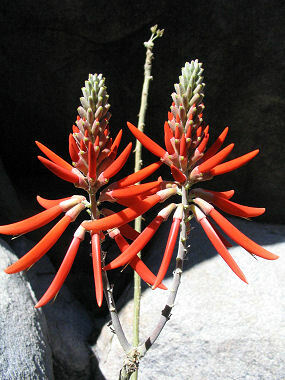 Southwestern Coral Bean blooms between May - July and produces a bright red flower with 3 inch tubular pea like petals that grow in a terminal cluster. The flower is followed by a large, thick walled seed pod to 10 inches in length.